Pambiche is a dance derived from Merengue and it is also an incredible Cuban restaurant in Portland. I was in Portland last July and this was the only repeat eating establishment on my eating itinerary. That is a rare honor because FOMA only allows me to go to a restaurant I’ve already been to when I’m on vacation if it’s AMAZING and that Pambiche is. Of course, I did order a different entree this time. I’ll provide a brunch play by play, so close your eyes and have a friend read this post to you so you can imagine you were there. We started with the assorted pastry basket. 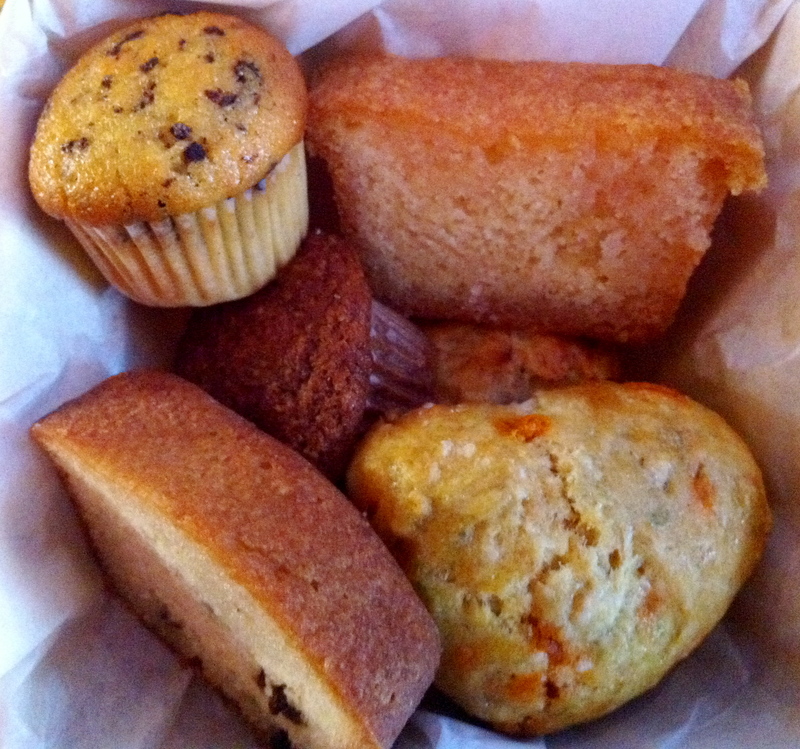 There were about seven different types of mini pastries, each of which we cut in three so everyone could taste them. My favorite was the lemon bread that tasted like a lemon bar in bread form. The lemon flavor was not overpowering and it had raw sugar on top that balanced the moist tart bread with a lovely sugary crunch. Perfecto! A close second was the bread soaked with rum with currants. The pastry basket is fun to get and share, but if I go back, I will ask if I can just get a bigger piece of the lemon bread. We shared the tostones (fried green plantains) and ate them with spicy banana sauce or chipotle salsa. Very yummy. A tad dry, but not in a way that is unpleasant. Plantains are starchy after all. This is almost a must order. I had the primera vuelta, which was clearly created for someone with FOMA and meant to share because it’s MASSIVE. No one would share with me, but I was undeterred. You get two empanadas, two croquetas, two frituras, and three kinds of salad. I picked the espinaca con queso (spinach, cheese) empanadas, bacalao con papa (codfish and potato) croquetas, and maiz (corn) frituras. 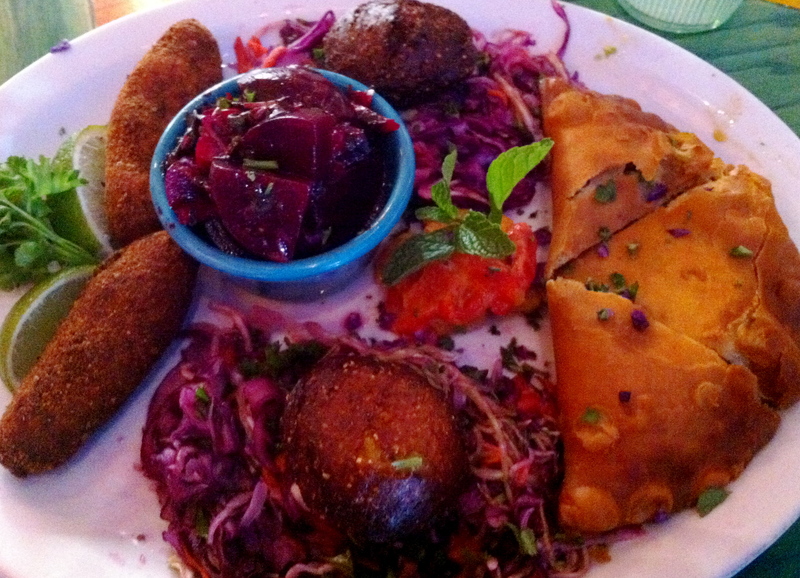 Empanadas – very good, not a must order, but that’s only because the bar is VERY high at Pambiche. At another restaurant, these empanadas might be a must order. Croquetas – very good, like a grown up fish stick, but better, almost a must order. Frituras – delicious, sweet like cream of corn soup, tied with the black-eye pea fritter that I snagged off my friend’s plate – must order some frituras – either corn or black-eyed peas, or both! The three ensaladas were de aji (roasted red peppers), de remolacha (beet and watercress), and de caribena (red and green cabbage). My favorites were de remolacha and de carbena. They were so fresh and delicious with the perfect level of acidity, and balanced my plate of fried magic well. Sidenote: At one point while I was eating, I wondered if Pambiche would be willing to overnight a sampler platter to me in California and I am currently wiping the drool off my keyboard. 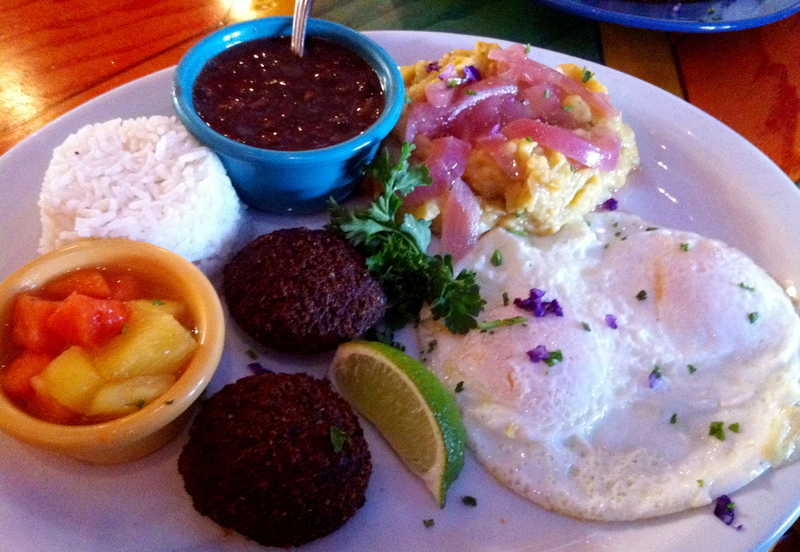 My friend got the vegetarian huevos a la cubana. I stole one of his bollitos de carita (black-eyed pea) frituras because he was eating them like he wasn’t going to give one up. It was really good as I’ve already mentioned above. 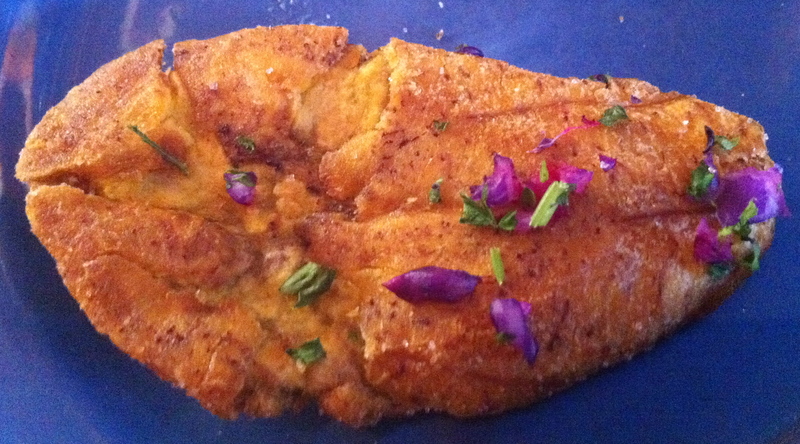 His dish also came with fufu de platano (plantain mash with red onion mojo), which I have never had and loved. He didn’t like it that much because he doesn’t like pickled things, which the onions are, but I loved it. I’d definitely order some next time. Mmmmm. 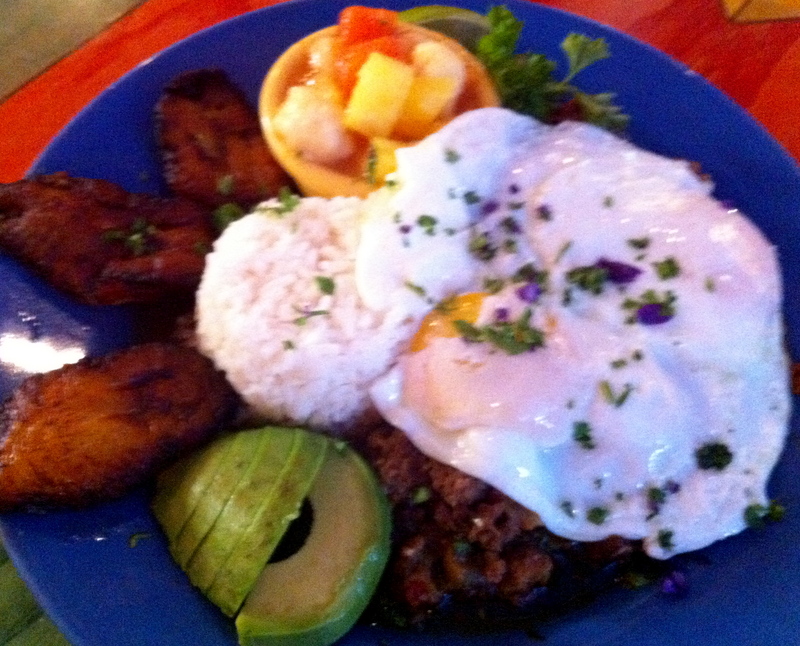 My other friend got the picadillo cua-cua (cuban hash and eggs). According to my friend, the surprise that made the dish was the chopped green olives and delicious capers. I didn’t try it (meatless wins over FOMA :o! ), so I’ll have to take his word for it. He pretty much didn’t talk after he got the dish, so I’m guessing it was really good and it’s really fun to say. 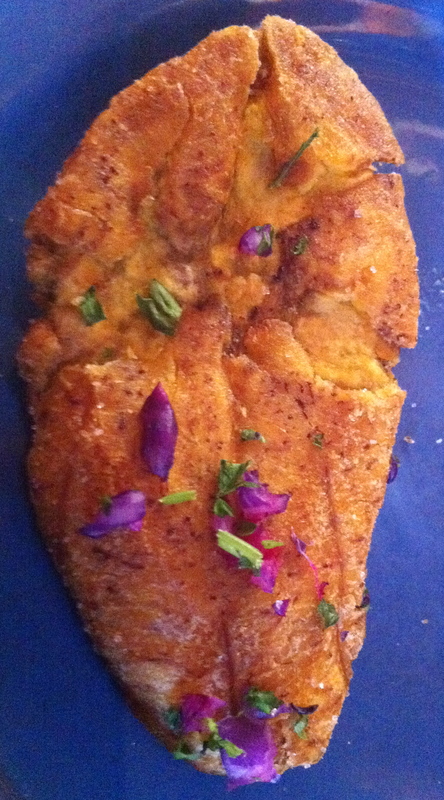 I did get a maduro (fried ripe plantains) off his plate, which was very yummy and not too sweet as maduros can be. I definitely recommend ordering a side of these for the table. Well Pambiche, Portland’s weather didn’t put its best foot forward, but your lovely staff, colorful decor, and food that partied in my mouth recast my vision of Portland from a gray, rainy city to a lively salsa party. I miss you already. I wish you’d move to the Bay Area.